The Democratic Federation of North Syria (DFNS) was founded on the principles of gender equality, ethnic and religious tolerance, sustainable ecology, and self-defence. Currently, the region is home to over 4.5 million residents, but this number consistently increases due to the ongoing arrival of (an estimated 250.000) refugees from newly liberated territory. The territory it comprises is about 30% of Syria which means about the size of Belgium. 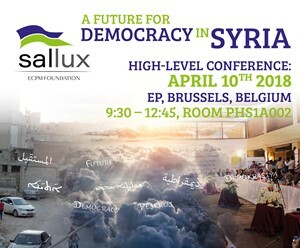 This high-level conference presents international speakers on this very important topic and will also have important representatives of the DFNS, form Syria itself. The first session will describe the structure of the Federation and how to “kill the mentality” of ISIS/Daesh and create the possibility form “European” refugees to return safely to the Federation area. The second session will discuss the issues of security, reconstruction and reconciliation in Northern Syria. The rest of the (closed / invitations only) conference on the 10th and 11th of April will consist of round table meetings.